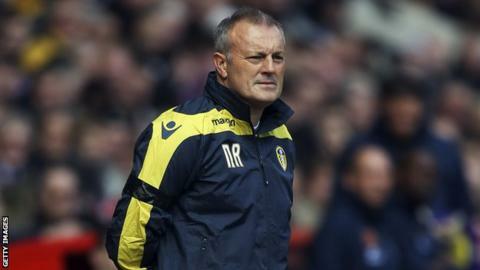 Leeds academy manager Neil Redfearn is understood to have verbally agreed a long-term deal with owner Massimo Cellino to become the club's new head coach, reports BBC Radio Leeds. But the former Barnsley captain has yet to sign a contract. Redfearn will replace Darko Milanic, who was sacked on Saturday. The 49-year-old was caretaker manager earlier this season, claiming 10 points from a possible 12 following Dave Hockaday's dismissal. Redfearn has also taken temporary charge of the club on three previous occasions and had full-time managerial experience with Scarborough and Northwich Victoria. He will become Leeds' fourth permanent boss in just five months after Milanic's 32-day, six-game winless sequence was ended following a 2-1 home defeat by Wolves on Saturday. Redfearn made over 1,000 appearances during his playing career, including over 300 for Barnsley. "I had a meeting with Massimo today," Redfearn told the Yorkshire Evening Post. "Nothing has been put down in concrete, but I wanted to see how he saw it going forward. "I don't want this to be a short-term thing, that is no good for anybody. He told me that he sees me here for the long haul and that he wanted me here with him. "I get on really well with him and understand where he is coming from. He is genuinely trying to do well for the club." Leeds are currently 18th in the Championship, five points above the bottom three and seven from the top six.